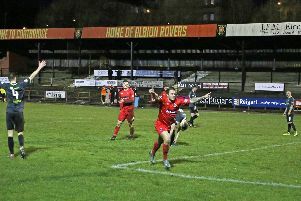 Defender Martin McNiff proved Clyde's match winner for the second week running to earn three points against Albion Rovers at Cliftonhill. On a day of precious few chances the defender got on the end of John Rankin's perfectly delivered free-kick to head past Peter Morrison with just 11 minutes remaining. Not quite as late as his stoppage time winner against Annan seven days previously. But no less welcome. It was the kind of game where a set piece always seemed the most likely route to goal. On a horrendously bumpy pitch Clyde struggled to get their passing game going from the off. Rovers battled hard to close them down and the result was a 45-minute stalemate in which neither side could manage a shot on target. Without ever being free flowing Clyde did improve after the interval and for the most part looked the most likely to break the deadlock. Scott Rumsby had a header saved by Morrison and David Goodwillie fashioned an opening with some typical trickery inside the box, but his effort was deflected into the side netting. Morrison produced the save of the match to divert another Rumsby header over the top and then denied Goodwillie who should have done better after getting on the end of a Rankin cross. The home side had been on the back foot for much of the second half, but almost snatched a goal 15 minutes from time. Ex-Clyde striker Smart Osadolor bamboozled Barry Cuddihy with his nifty footwork inside the box before unleashing a strike which smacked off the outside of Blair Currie's right-hand post. That was as close as they came though, and four minutes later they were behind thanks to McNiff's latest goalscoring intervention. Goodwillie could have made it two in stoppage time but skied over with just Morrison to beat after the ball took an almighty bobble just as he pulled the trigger. It kind of summed up his, and Clyde's, day. But in the end they got the job done to stay in touch with Peterhead ahead of next week's showdown between the two at Broadwood.